Update for 2013: SparkCon does not appear to have a “KidSpark”, but I believe that the KidZone on Hargett and Fayetteville will have similar items. Also, see my 2013 SparkCon article for current links, this one is from last year. SparkCon features again a corner just for the kids, located at Davie and Fayetteville. Build a pinwheel (and keep it). Walk the runway (with a paper hat). But you would miss a lot if you only go to the kids’ section: circusSPARK promises some sparkling performances, and wheelSPARK is all about skateboards, with demos all day Saturday and Sunday. 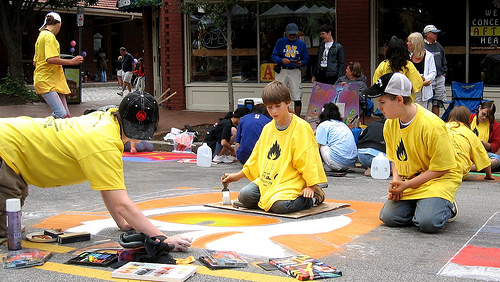 And what child wouldn’t like streetpainting? The good thing about SPARKcon is that most everything is close together; head out to Fayetteville Street and see what you like! SPARKcon started yesterday and continues through Sunday; check out the schedule on the website or just head out and see what exciting thing you run into.